Komikado Kensuke is a cranky, sharp-tongued, cynical, wasteful lawyer who loves money, reputation, and women. He believes in the idea that �gthe winner is right,�h and uses any means to maintain his perfect-win record. However, he gradually realizes that his idea of justice is wrong, and he begins to remember what it feels like to really fight. Mayuzumi Machiko is a rookie lawyer who is passionate about protecting the weak and is constantly at odds with her colleague Komikado. This dorama has everything one is looking for in a comedic jdorama: a great cast with strong leading characters (Sakai Masato invents a unique character, over the top but almost in a credible way, and well balanced by the calmer play of Aragaki Yui), a lot of side-jokes, sub-plots with good characters, a fast-pace editing, good character development (with some ambiguity that adds to it), and the combination of a new story for each episode & a larger plot that unfolds towards the end. If you're looking for one of these modern well-executed comedies (something like Hotaru no hikari or My Boss, My Hero) with a lot of good laughs, you're in for a treat! I almost skipped this drama because comedies aren't really my thing and I had no interest in a legal drama, but I tried watching it because Aragaki Yui was in it, and I'm very glad I did. Actually everything is pretty much perfect with this drama. It's funny and it stays consistently funny, even in the end where most comedies fall into a train wreck at attempting to become serious. It has a great balance of "episodicness" while decently pulling off a larger plot. The individual cases were interesting, and I enjoyed listening to the logic of the individual arguments. And did I mention it's funny? Again I was quite impressed with the ending, shows like this so often take a random episode just like all the others and try to package it as more serious this time because IT'S THE ENDING! Whereas here the last three episodes led up to a truly more serious ending but at the same time turning it into a flip-flopping mess of hilarity. It's still not really my type of drama, but that's no fault of the show itself, and so I don't think I can find one real negative thing to say at all. Quite impressive. Definitely entertaining. Actually, I take that back -- funny as hell. It's been a while since I have found myself laughing out loud like this. The apex definitely is not the last case but the second to the last, when we have Komikado give that crazy @$$ motivational speech -- unforgettable. Could have ended better is my only complaint -- loved Masato Sakai and Aragaki Yui were perfect in their roles. This one is a high-speed comical dorama! Some cases were boring to me, but overall it was fine and funny... And Komikado just always ended surprising me. I saw Sakai Masato in Nankyoku Tairiku and in Himitsu no Hanazono and I didn't like him at first, but he's just superb in Legal High and I came to appreciate his good acting skills. I will be waiting for season 2! Entertaining drama, and was hooked from beginning to end. the genius lawyer who never loses and will employ any tactics to win and the startup new lawyer who goes by the book and wants to do what is right instead of cheating to win. The 2 characters had great chemistry and the cases presented were intriguing though over the top sometimes. Good Points - Started off well, some interesting cases, some good gags. Bad Points - Overacting - Sakai Masato must have taken a leaf out off the Jim Carey school of acting ( the only person who came out credibly was Koike Eiko), and rubbish ending. Quite enjoyable. I found the lead characters very interesting and quite funny. A lot of the vocab was a bit over my head but it was sill fun! I really love Sakai Masato's performance. Absolutely fantastic! The first 5 episodes, I hated it. Sakai was too over the top. But starting with episode 6 it got a lot better, although my basic reaction is the same as Aragaki's, "What the hell was that??" Wow~! What an intelligent, original comedy! Good good stuff! This comedy -drama got awards for best screen writer and director 73rd Japanese Television Academy Awards. A must see. Fun and fasted paced and a totally different character for Sakai Masato then he played in Hanzawa Naoki. Aragaki Yui is just as cute as ever! 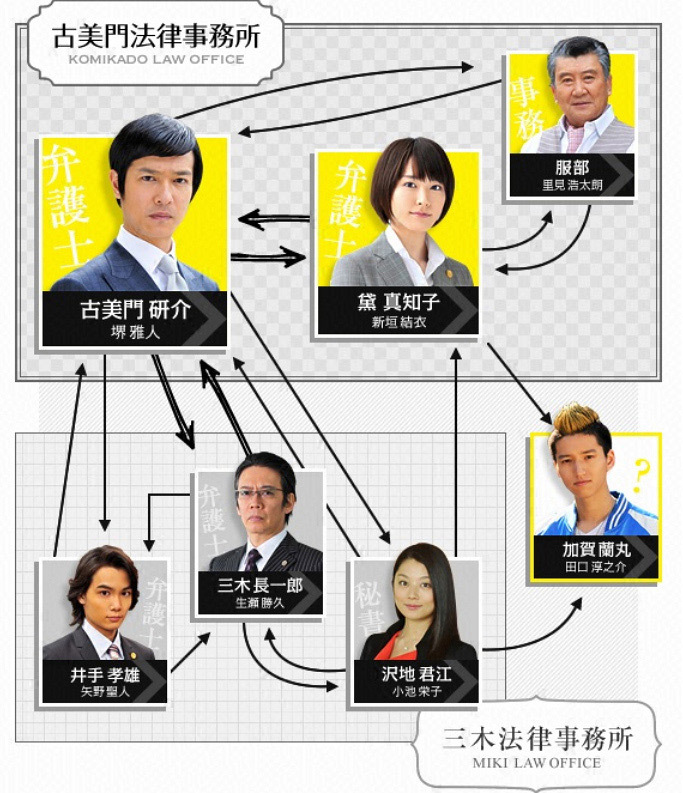 Funny story and unexpected story at the end... quite enjoyable watch this drama... Komikado as lawyer really good at speech!! Pretty entertaining, but there's not a lot to it. The transition of main characters weren't very clear. Laughs, laughs. BTW, if you really listen to Komikata, you may learn a thing or two. Not very good but still fun and more than watchable. A little over the top at times but a great comedy. I loved it! It's super interesting! Very funny and interesting cast. My favourite comedy for 2012.